A Victorian Government digital agriculture initiative to trial Internet of Things (IoT) technology on-farm – due to kick off – is looking to help future-proof Victoria’s farming sector. IoT is a buzz phrase cropping up with increasing frequency in business, including agriculture. But what, exactly, does it mean? In short, IoT refers to a network of internet-connected devices that can send and receive data. And in agriculture, IoT benefits are far reaching. It can, for instance, allow remote monitoring of soil moisture, weather, disease control, stock tracking or crop yield, leading to enhanced productivity, competitiveness and sustainability. To that end, the Victorian Government is investing $12 million in an IoT trial to assess how the technology can be best rolled out in agriculture statewide. And that’s a particularly smart move, considering Victoria is Australia’s largest agricultural producer, generating $13.16 billion of product from 12 million hectares of land. 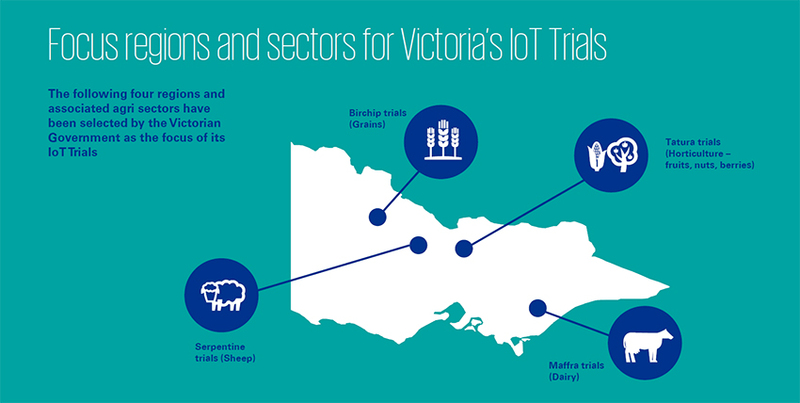 Run by Agriculture Victoria – who will partner with farmers to tailor the IoT offering to their individual needs – the trial will cover four farming types and regions: dairy in Maffra, orchards in Tatura, sheep in Serpentine and broadacre cropping in Birchip. Why those four? Because they represent the state’s largest agriculture sectors by number of businesses. And because Victoria has a diverse agriculture sector, meaning what works for one farm business and region may not be the same across other sectors and regions. The trials could act as an exciting catalyst to drive increased on-farm performance and create a globally-significant, digitally-enabled Victorian agribusiness sector that attracts technology solutions providers, investors, agribusiness companies and researchers. Even bigger plans are on the horizon, too. The Victorian Government recently announced a further $15 million for digital agriculture initiatives to apply the lessons from the trials across the state and sector. Want to know more? Explore the IoT trial details or register your interest. Get acquainted with how Agriculture Victoria is developing innovative farming systems that bring economic and environmental benefits. The government has contributed $1 million to SproutX, an AgTech accelerator connecting innovators, investors and farmers and sharing information on the very latest digital agriculture technologies and applications. The Connecting Regional Communities Program, of which the IoT trial is a part, is designed to improve connectivity and support uptake of digital technologies in regional and rural Victoria – including funding to address mobile blackspots. Agriculture Victoria is supporting farmers to innovate products and processes through programs such as the Food Innovation Voucher Stream, as well as encouraging farmers to improve their energy efficiency, productivity and security through the Agriculture Energy Investment Plan.